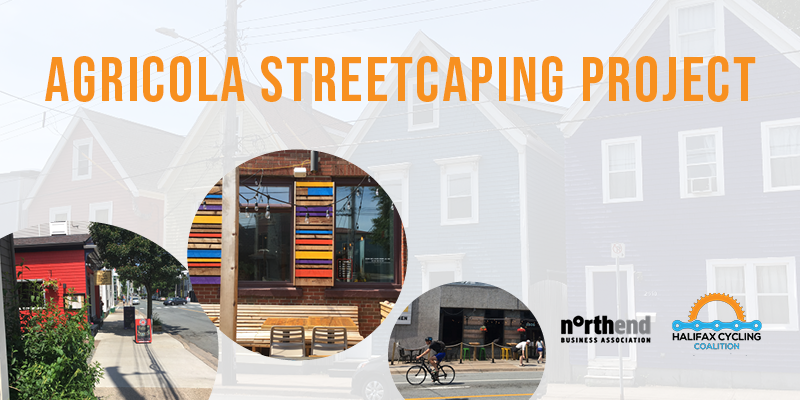 Since 2014 the Halifax Cycling Coalition has been working with the North End Business Association (NEBA) to advocate for streetscaping and traffic calming measures to be applied on Agricola Street. On July 17, 2018, we held a public information session to share updates about streetscaping on Agricola Street, which is scheduled to happen in 2019 as part of a larger re-paving project. Read on for more information. 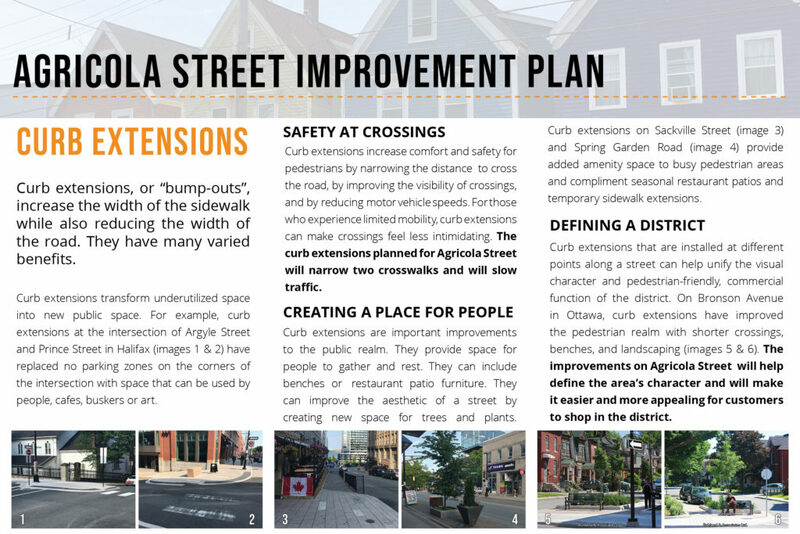 2014: NEBA and HCC collaborated on developing an enhancement plan for Agricola Street that included curb extension at intersections between North and Cunard. This concept plan was presented to Halifax Regional Municipality (HRM) for consideration in 2015. 2015: HCC piloted a bike corral project at the intersection of Agricola and Charles. Although there were some challenges with setting up this pilot project, it ultimately was very successful, and the bike corral program continues. 2017: To bring ideas and information together as a part of the ongoing discussion about Agricola Street Enhancement, NEBA and HCC, in cooperation with the Licensed Professional Planners Association of Nova Scotia (LPPANS), hosted a workshop featuring Gary Toth. Gary Toth is the Senior Director of Project for Public Spaces, specializing in planning, design and education to help individuals and governments create and sustain public spaces that build stronger communities. The Agricola Street workshop brought together a dedicated group of stakeholders including representatives of HRM, HCC, NEBA, Agricola Street businesses, and local residents. 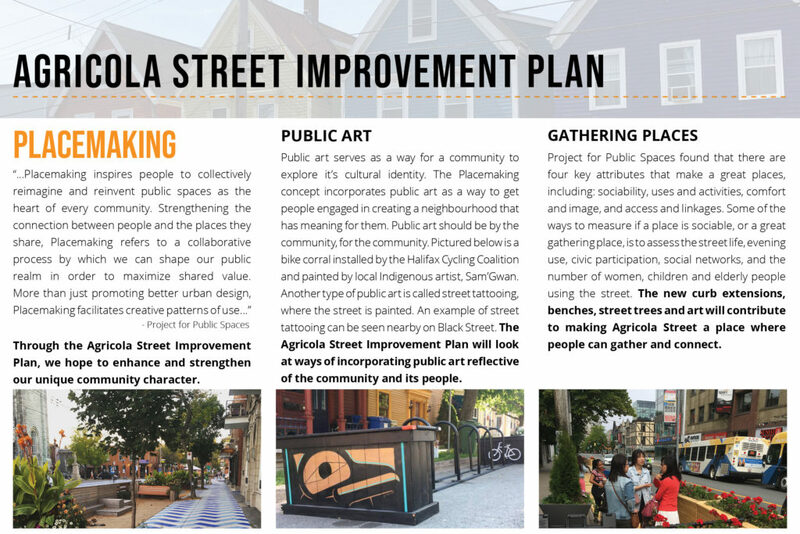 The intent of the workshop was to inspire everyone to think outside of the box to develop a shared vision for Agricola Street and identify the next steps that will advance this important project. 2018: On May 15th, 2018, NEBA and HCC met with urban design staff from HRM to discuss the Agricola Street Enhancement project with regards to the new Integrated Mobility Plan and how new policies address Complete Street projects. Hanita Koblents, Urban Designer with the municipality, gave a presentation about the breadth of work being planned for the recapitalization project on Agricola Street slated for 2019, including a budget. 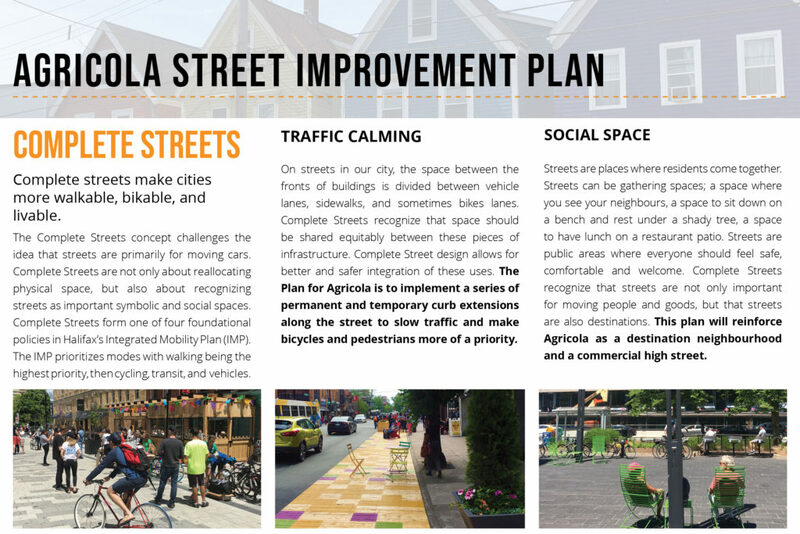 Koblents also presented the Complete Streets policies in the IMP and what that means for Agricola. The total budget for the recapitalization project is approximately $485,000, with 15% ($72,750) set aside for the addition of Complete Street elements. On July 23, 2018, HCC and NEBA held an open house to share information with the public about the streetscaping that will take place in 2019. 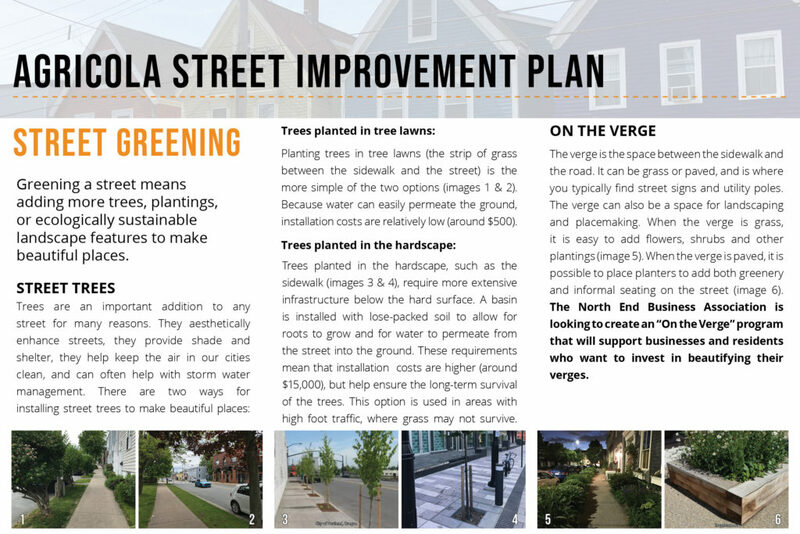 HCC and NEBA are recommending that HRM prioritize hard infrastructure like concrete curb extensions in their 2019 project, and we will continue to work with HRM and businesses along Agricola Street to add in things like street trees and benches over the coming years.